Hair Cuttery is a chain of hair salons that provides a variety of affordable services for people of all ages. Today, they have over 800 salons located mainly along the East Coast. These salons focus on going above and beyond for their clients by giving them fresh hair styles designed to make them look their best and meet their goals. Hair Cuttery prices start at around $18 for a standard adult haircut which includes shampoo. While Hair Cuttery is a chain of franchises and company-owned salons, it still has that family-friendly small business feel that makes customers keep returning month after month. Customers enjoy the fabulous prices while coming away astounded that they were able to get such an amazing haircut for the low price. At Hair Cuttery, customers experience the classy feel of being in a high-end feel salon without feeling the cost in their wallets. The stylists also add to this posh feeling by providing complete consultations and unique cuts and styles based on one’s face shape and personal desires. Clients can even bring in pictures from magazines or Pinterest to show stylists the type of cut or color that they like. At the end of the salon experience, stylists ensure that every customer leaves feeling completely happy and satisfied with the results. The beauty of a Hair Cuttery salon is that clients can enjoy friendly, individualized services at great prices without the need for an appointment. Hair Cuttery salons offer a full range of cuts and styling services for men and women. Their value packages also include some of the most popular options at discounted prices to help clients enjoy full treatments that allow them to leave the salon feeling their most beautiful. For example, the VIP treatment includes a shampoo, scalp massage and haircut. They also offer a complete array of chemical services, from Redken chemistry treatments to highlights, all-over colors and relaxers. Keratin treatments soften hair while perms and texturizing treatments add depth to hair. Salons also offer waxing services for the face, hands and forearms. Men can choose gray blending treatments or full color application to look their most distinguished. Children who are eight years old and younger can get discounted shampoos, haircuts, clarifying treatments or simple bang trims. Hair Cuttery offers a salon-exclusive brand known as Cibu, which includes shampoos, conditioners, treatment oils, styling products and travel-sized products. Many of these products are sulfate and paraben-free for health-conscious consumers. All are safe on color-treated hair and many are formulated for dry, oily, frizzy or aging hair. However, Hair Cuttery also offers popular products from the Redken and Matrix lines, which are high-end salon brands. In addition, customers can pick up tools at most salons to help them cleanse and style their hair. Many of these tools are also under the Cibu line and include combs, blowdrying brushes and paddle brushes. Hot Tools hair driers, flat irons and curling irons are popular investment products for many customers. Dennis and Ann Ratner began the Hair Cuttery line of salons in 1974. The year prior, Dennis had been working for a family salon business, and Ann was getting progressively frustrated with the subpar level of hair care offered where she lived on the East Coast. Together, they drew up a business plan, and Hair Cuttery has thrived ever since. 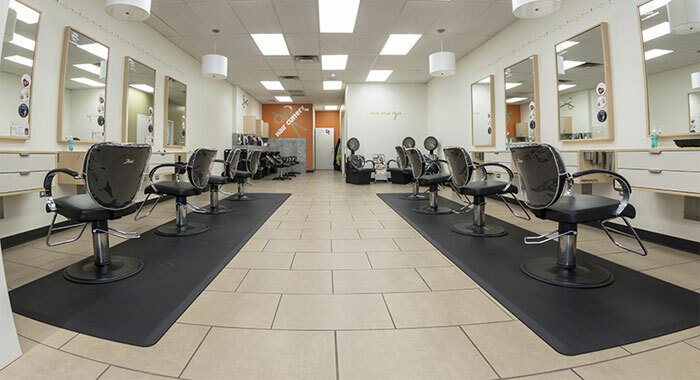 Today, Hair Cuttery has over 850 company-owned and franchised salons and over 12,000 employees and associates. The salons are located mainly along the East Coast, including the New England area and Florida. Some can also be found in Chicago as the company continues to grow. Hair Cuttery is proud to be called the largest family-owned salon business existing in the United States today. While some salon brands have more franchises, they are not family owned. Therefore, Hair Cuttery can boast that it has that small-town, family feel that many clients crave. Currently, Phil Horvath is the president and chief operating officer of Hair Cuttery. He has been in this position since 2016 and accumulated over 25 years of experience in salon business and sales prior to that. With new leadership, there are sure to be many fresh new ideas at this already great chain of salons. I would speak to the manager of that particular location. The prices of many services can vary depending on hair length, condition, etc. but it shouldn’t come as a surprise to you the customer. But I consider this particular stylist’s response unprofessional. If you want, you could also send a private message to them on their Facebook page. They seem to do a really good job responding to any complaints.